A Little Diamond: Halloween Costumes! 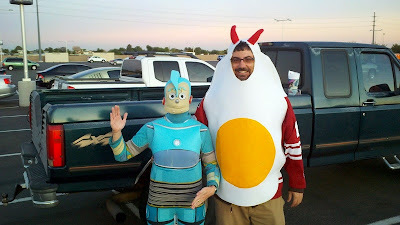 Pat and I spent all damn day on Saturday creating the most awesome costumes ever! The costume construction involved visits to Michaels, the UPS store, Home Depot and Party City. Then it involved manipulating some very large pieces of styrofoam and moving furniture. Then it involved math. A lot of math! Then there was some heated arguing about math, in which Pat insisted "Math doesn't lie!" Eventually he sheepishly admitted that you need to put the correct numbers into the formula first, and then math won't lie. After the math, we got out the knives and got on our knees for the serious work. Then we got out the spray paint. Then, after umpteen hours, we were almost finished making the most awesome Halloween costume ever! They just needed the final embellishments. The plan was to wear these really awesome, clever, cool costumes to a pub crawl/costume contest evening in Cave Creek, then over to Nichole's for her annual costume party. We were going to steal the show all night long! Then we got a call from NFBF reminding us that we had hockey tickets for that night. Dang it. 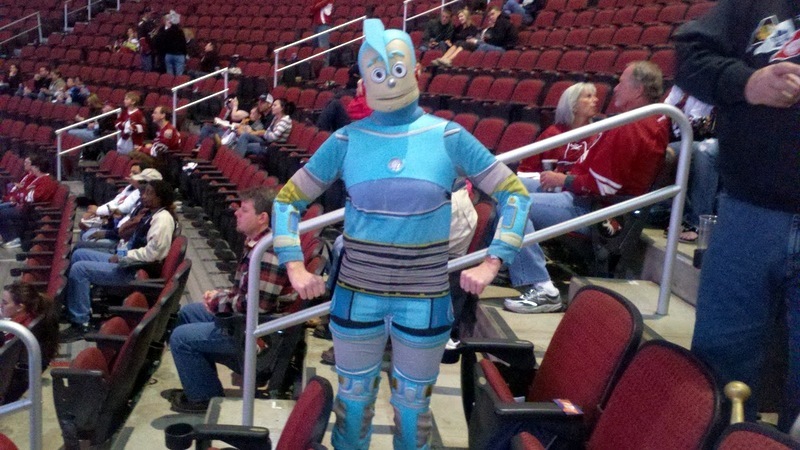 Our pain-painstakingly created super awesome, funny, amazing costumes wouldn't fit in arena seats! Crap. With little time left before the game, we had to make due with costumes we had on hand: Robots like hockey: After the Coyotes won the game (woo hoo! ), Pat went to his own hockey game and I went to Nichole's party, where I did not steal the show but I had a very nice time anyway. We were allowed to wear costumes to work this year. 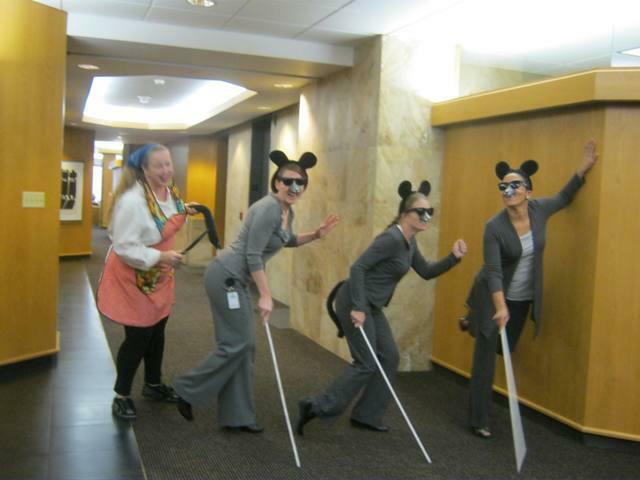 I told the girls in my hallway I would bring the props but they had to wear gray and be good sports. They did and they were. A secretary that sits near me was coerced to be a farmer's wife. She was quite dangerous with that knife! Book club had a Halloween theme this month. 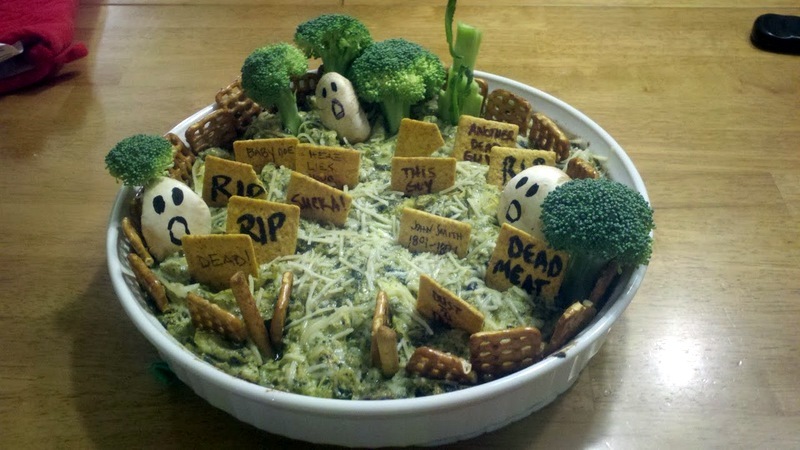 I made graveyard pesto-artichoke dip. Yummy! Hi, very nice costumes. What did you use in the pesto dip to make the white ghostly figures? They are mushrooms, carved with a steak knife. The recipe I cheated off of said to use hard-boiled eggs but I thought that would be too much work!